I’m not sure if I’ll have to stop making toys and selling them. I hope not but, what I’ve heard about the Consumer Product Safety Improvement Act is making me worried. Now, I make one of a kind, plush dolls at home and there is no way I could afford these tests; they are ridiculously expensive. It might be feasible for a large company but for me it wouldn’t make any sense, but the regulation has no exemptions; they would treat us the same. Right now, I buy all of my materials, retail. However, you can’t, according to the new regulation, use tests done by your suppliers. The end product has to be tested. Also, if you ignore the regulation and sell stuff for children anyway, you can get fined per infraction and possibly go to jail. Simply, labeling your items for twelve and up isn’t an option because they are going by the commonly accepted use of a product; if its generally regarded as a children’s product the act applies. I think its important to keep kids safe but the regulations are poorly written. 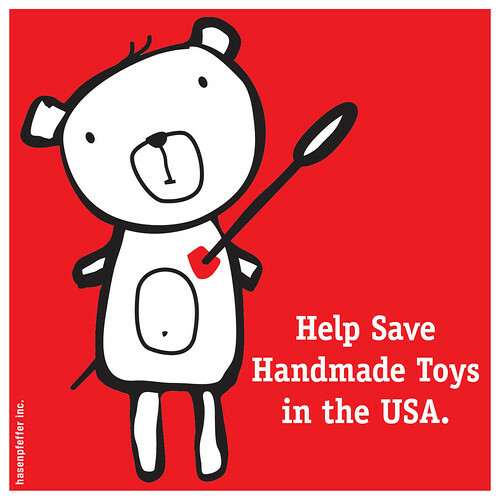 The bill passed congress in reaction to all the recalls if imported Chinese made toys that were found to contain lead last year. So, it has for the most part the support of the congress and the public. People just don’t realize that the way the thing is written now, it will put a lot of people out of business. Which is a really crap thing to do in a horrible economy. *Image at top by Hasenpfeffer Inc. This entry was posted on December 12, 2008 at 7:21 am and is filed under Miscellaneous, Uncategorized. You can follow any responses to this entry through the RSS 2.0 feed. You can leave a response, or trackback from your own site. Nice of wordpress to link to articles in FAVOR of the law directly after your post. The one I read had no mention of the issues you bring up. If the problem originated in China, with them not conforming to existing US limits on lead, why does that necessitate lowering the current US limit? If China didn’t respect the last limit why is a lower version going to affect them? And if China is the problem, why are we putting the impetus on American Manufacturers? It just feels like no part of this actually addresses the issues of the problem its ostensibly being designed to combat. In fact, by increasing the costs of domestic manufacturers, and putting smaller producers like Daniel out of business, doesn’t that just mean larger corporations will increase their market share- and address the increased costs by importing more goods from China?? I’m a good liberal and like strong environmental regulations, but it seems like this is just wrongheaded. Hi! my spouse and i ask so what’s this particular template a person associated with your own weblog? thanks.